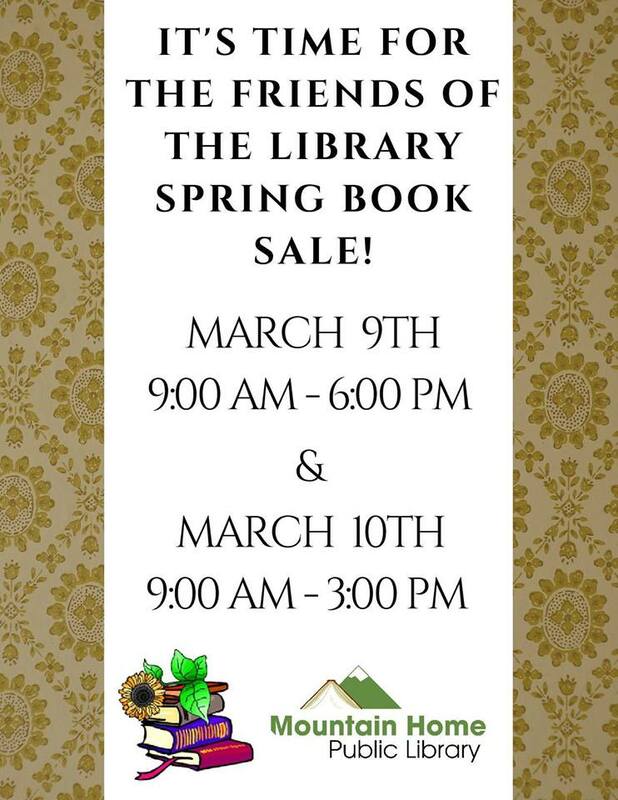 The Friends of the Mountain Home Public Library are planning on an "Emergency Overstock Book Sale" next month, on Friday, March 9th (9am to 5pm) and Saturday, March 10th (9am to 3pm). The Friends have been receiving many boxes of donated books to help support the Library, and we are running out of space to store them! The book sale will be held in the NE corner of the Library, back where our "Book Nook" is located. We plan on several tables full of newly-donated books, and our prices remain a great bargain - $1.00 for hardbacks, 50 cents for paperbacks, and 25 cents for children's books. All funds raised from the sale of donated books are used to support Library programs. tagged with Mountain Home, Mountain Home Idaho, Elmore County, Mountain Home Public Library, Friends of the Library, Spring Book Sale!